Cops work with facts. Evidence comes from things they can see, feel, and hear. But Detective Rowan Black has a foot in the hidden world of the occult, too. 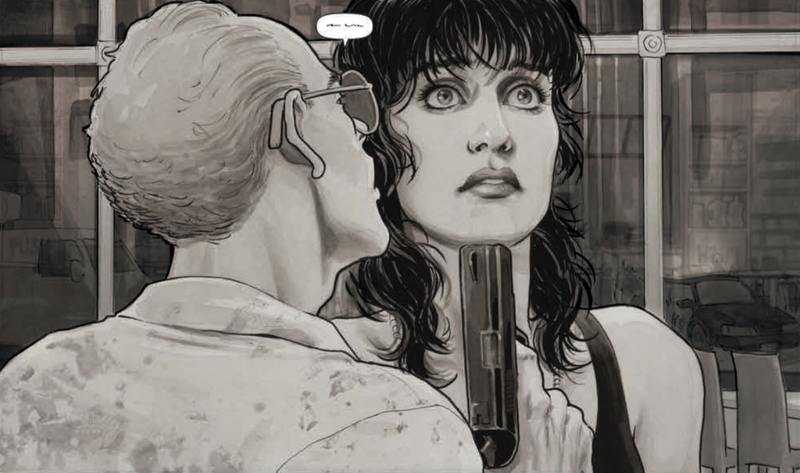 In Black Magick #1, the two parts of her life collide, marking the very promising start of a new horror suspense series. It opens with a Wiccan ceremony deep in the woods but Black Magick #1 happens in a grey-toned setting that could pass for the real world. The occult gathering gets interrupted by a phone call to Rowan’s phone. Setting aside, that interruption is the kind of occurrence that happens at dinners, meetings and gatherings everyday. We’re still only at moderate levels of weird. As Rowan rides off to a hostage crisis where an armed man specifically requests her presence, the reader is left hanging as to just how prevalent magic is in the city of Portsmouth. And when otherworldly forces get revealed at the end of the issue, it’s a portent that a delicate balance is about to be upended. This first issue comes from the creative team of Greg Rucka, Nicola Scott, Jodi Wynne, Chiara Arena, Jeanine Schafer and Eric Trautmann. I first encountered NIcola Scott’s art during her time on DC Comics’ Birds of Prey title and she was good then. But Black Magick is the best work I’ve ever seen from her. Rowan and the other people in this book feel appropriately rumpled, frantic, blustery or weathered. The colorwork by Scott and Arena is fantastic, too, muted enough to suggest mystery and depth with just enough glowing hues to create spikes of interest throughout. Black Magick #1 does a lot of things well for a first issue, setting up a believable world with secrets lurking under the surface and hinting at the terrifying consequences that follow when those secrets get revealed. Rowan’s confrontation with the gunman provides a satisfying arc unto itself while subliminally sketching out her witchcraft lineage and her character’s relationship to other police officers. The book’s backmatter teases that Rowan’s bloodline has been of cyclical importance throughout history and suggests that there’s a lot of creepily entertaining tension waiting to break through.